The complimentary event is exclusively for Bells Up’s Fanfare Club Members. Although Bells Up’s wines will not be sold at the event, a selection of wines from other producers in Oregon’s Willamette Valley—stocked by 1215 Wine Bar & Coffee Lab—will be available for purchase by the glass or bottle. Previously a Cincinnati resident, Specter built a successful career as a corporate tax attorney specializing in mergers and acquisitions. In 2009 he walked away from practicing law to dedicate himself to the art and craft of winemaking. He subsequently held an assistant winemaker position at Henke Winery in Cincinnati for three years. After winning two national amateur winemaking competitions with two different wines in 2011, Specter and his wife, Sara Pearson Specter, decided to relocate and open a winery in Newberg, Oregon—an area they fell in love with while on vacation in 2008. They purchased a 10-acre property in 2012 and established Bells Up Winery in 2013. As one of the Willamette Valley’s newest micro-boutique wineries, Bells Up produces approximately 400 cases annually. Specter specializes in composing handcrafted, classically-styled Oregon Pinot Noir with grapes sourced primarily from micro-growers located on the northern side of the Willamette Valley. A small selection of other Oregon-grown and produced varietals is also offered. For more information about Bells Up Winery, please contact Dave Specter at info@bellsupwinery.com or 503.537.1328. 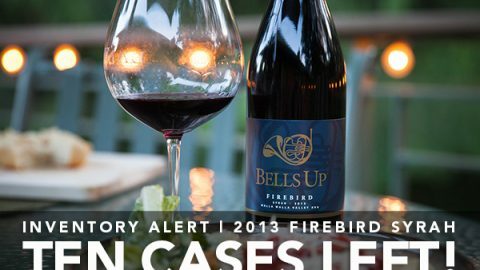 Just 10 Cases of 2013 Firebird Syrah Remain… Get It While You Can! We're everywhere! Loads of media hits over the past few months for Bells Up...Bells Up Winery to pour wines at Rubies and Roses 2016 fundraiser.